The San Diego Union-Tribune was the latest example of this, as it officially changed ownership hands Thursday for the third time in six years. This most recent purchase came from Tribune Publishing Co. for the amount of $85 million (including nine community papers). Still waiting for a buyer is the 96-year-old New York tabloid the Daily News, which owner Mort Zuckerman put on the sale block this spring. But there seems to be far from a stampede of interested buyers. Steep revenue and circulation declines across the newspaper industry have left many newspapers struggling. Over the past decade, weekday circulation has fallen 17% and ad revenue more than 50%. 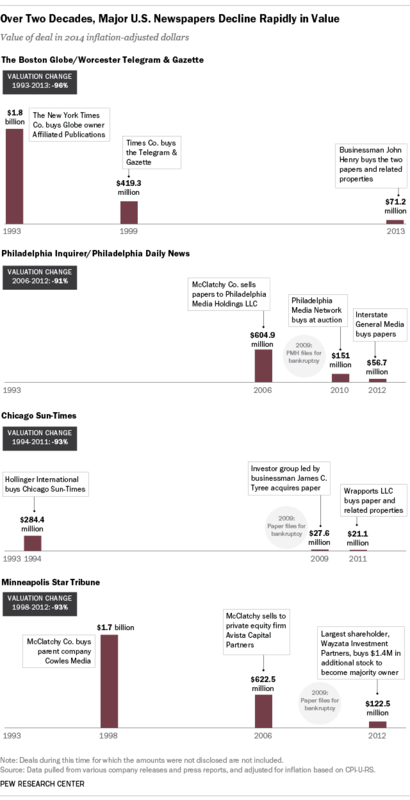 In 2014 alone, three different media companies decided to spin off more than 100 newspaper properties, in large part to protect their still-robust broadcast or digital divisions. Amazon.com founder Jeff Bezos may have stunned many with his $250 million purchase of The Washington Post, which was last sold at auction in 1933, but other recent sales of major papers show dramatic devaluation and suggest a tough road ahead for the newspaper industry.